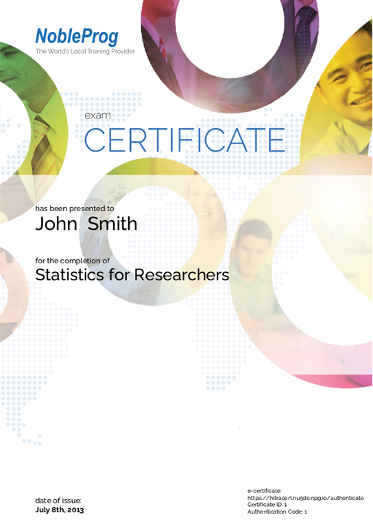 The idea of a paper certificate confirming knowledge is a relic of the past. Today most people value quick and easy access to all of the documents. The digital version of the certificate gives you just such a possibility. We are trying to reduce waste and carbon footprint, as well as increase the comfort for our delegates. After the course you will receive an email with certificate ID, authentication code and the link from authentication: https://cert.nobleprog.com/authenticate. Additionally you will receive special link to automatically upload certificate to your LinkedIn account. You can put this information in your CV, on your Linked-in account or other suitable places to confirm completion of the course. On the request of participants we issue as well paper certificates.